I am putting a new Carb on the 350 on my 71 Firebird. The carb doesn't have the throttle arm for an automatic transmission, is there an easy way I can modify or change out the throttle arm to hook up the TV cable for the turbo 350? 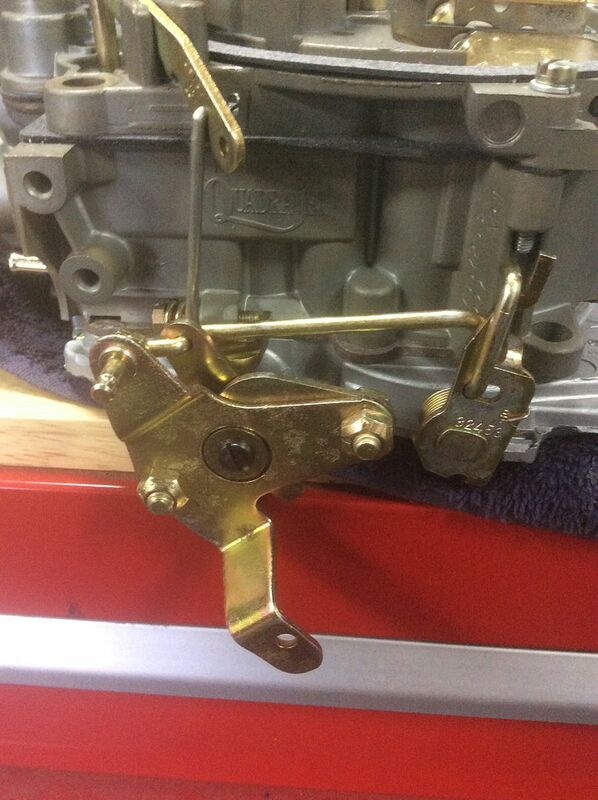 I have a throttle arm for an automatic trans, I just don't want to take apart the carb too much to change it if there is a simpler way of going about it. Might help to post a pic of your carb & it's casting number. From what you posted, I don't know if your new carb is a 2 or 4 barrel, a Holley, an Edelbrock, or a Q-jet of some some kind. ? But, I assume that if you are a good fabricator you can probably make some sort of bolt-on kickdown lever that will work. If its A Holley 4 bbl or Edelbrock carb you can buy the TH350 Kickdown cable hardware that bolts right on. I've never modified a throttle arm. I'm sure there is a way to remove them entirely but I never tried it. During the early years, the Pontiac Q-jets had bolt-on arms. Later models would probably require removing the butterflies, pulling out the shaft, and replacing the entire shaft/arm. Its a Quadrajet 4bl, It does have the bolt on arm like the one oldskool posted.
" Its a Quadrajet 4bl, It does have the bolt on arm like the one oldskool posted. " If that's the case, you may be able to find a used bolt-on arm that came off a TH350 equipped car. PY is usually the best place to find stuff, since there are so many members who post there. Trying to think of those early year cars that would have come with a Q-jet & TH350. Most Q-jet equipped cars I can think of had a TH400 trans. Don't know about the '68-'69 350HO cars. If those cars didn't come with a TH350, then there might not have ever been a '67-'71 Pontiac which came with a Q-jet & TH350. Anybody know of one ? After '69, I think the next 350 to use a Q-jet was in '74. Others had a 2 barrel. Since it is a bolt-on piece, that should make it easier to modify the manual trans arm, or fab up one that will work. Just lookin at the arm, it appears that you might be able to rig up a cable attachment where the return spring hooks. Easy to move the spring towards the carb. May have to move your cable bracket towards the firewall. Or, if the cable is too short, you can just add a simple extension, either homemade or store bought. TH350's were optional on Firebird and Tempest starting in the 1960's. They were used on engines as large as a 350HO. Initially they had 3 automatics, with the 2 speed as the cheapest one. As far as I can tell, they were never used on the grand prix or "major" pontiacs in the early 70's. "...They were used on engines as large as a 350HO..."
Do you know this for a fact ? If so, please post links to this info. Thanks ! If the 350HO was the only '68-'71 Q-jet equipped Pontiac engine that came with a TH350, that will make those TH350 throttle arms very rare. Just found this article that says the '69 350HO Birds came with either a manual trans or a TH400. Can not verify. Since it is a removable piece of the shaft , I am going to try and fab up something. I don't know if there is a correct factory piece for it . Mainly because I am assuming that Pontiac did not offer a QJ 4bl carb, with the TH350 for those specific years. For that year range (67-71) for the GTO/ Lemans I am guessing that motors with 4bl carbs either got a 4 speed manual or a TH400, whereas Motors equipped with a 2 BL carb got the TH350 trans as standard package. I would think you could use the throttle shaft bracket from a 75-up Pontiac that came with a Q-jet, since many had th350's, like the Firebirds/TA's and probably some Lemans in those years.
" I would think you could use the throttle shaft bracket from a 75-up Pontiac that came with a Q-jet..."
I think those levers are permanently attached to the shaft. But, I suppose one could be cut off and modified to bolt onto the early shaft. Here's one said to be on a '78 Bird. It has a cruise control cable, as well as a TH350 kickdown cable hooked to the throttle lever. Here's one without the cruise cable. The kickdown cable is not attached. It appears that the lever is just bradded onto the end of the shaft. So, I suppose you could just grind off the bradded part and slide the lever off. Guessing it would be easier to fab up something, using the original bolt-on lever. There are several brands of kickdown cable studs. Don't know if one of these, or at least the pic will help any with a fab-up, or not. I vaugley recall 1970 & maybe 1971 Firebird Espirit had a Q-jet & TH350 Trans. Might have to look at Oldsmobile 350 V8 with a Q-jet. Many used a TH350 Trans through the 1970s. Did someone say Olds 350 lol? I can tell you that the engine we pulled for her wagon is just that, and it was NOT mated to a TH350 in the car we pulled it from. No sir. It had a TH375 of all things. This came from a 76 Delta 88. Meh. Now the carb, OTOH, had to be modified in order to use the kickdown cable for the TH350 that we installed. It was a very simple matter of using JB weld to attached a mounting nub to the throttle arm of the carb. This allowed the kickdown cable to mount right up. To the OP, a little ingenuity and creativity goes a long way if all you are looking for is functionality. If you are looking for factory correct look, you would be better off swapping carbs IMHO. Actually looking for a TH375 . Its a Turbo 400 stripped down to less frictions and steels inside with a special extra long Turbo 350 output shaft. The output shaft I want. For a future project putting a Turbo 400 into my 87 Corvette Convertible. A friend on the Vette forum side used to drag race & is a NHRA NMCA 5 time world champion & in the record books. From Chicago not far from me. Told me how he did it. TH 375 output shaft used. 9-second car he had. Used to Street Race it too. I haven't read this entire thread RA, but did you say you're looking for a 375? I've had one in my garage for 30 years. Came out of a 1973 Catalina with a 400 2bbl. As you mentioned, it's nothing more than a step down TH400. Why would anyone want one? Granted I can see it beeing stronger than a TH350, but why not go for the whole ball of wax, and use the 400? but you can't sell a young man an old mans car"
So the carb that was installed has an ID # 7045268 . Now I know that it was not OEM to the car because it was a 350 2V . The P.O. installed a 4 Bl intake and put the existing carb on it. The carb I would like to install is 17056312 From my knowledge it was setup with the GTO throttle linkage. I have a Chevy 350 Q-jet put away. Believe for a Turbo 350 Trans . Try and did it out in the morning and look. For a Street drag race project with my 87 Corvette. It does not use a convential trans crossmember as we know on 2 nd gen Birds. Has a built 700R4 I did myself in 2010. Anymore than 500 Hp and its living on borrowed time. C Beam is used to connect and support the rear of the trans to the IRS Diff. Turbo 400 yoke sizing too big to make the swap TH400 easy. Why a TH375 Tailshaft needed. Got the full scoop how to do it Tahoe. Just lookin back over the thread & saw this.
" I vaugley recall 1970 & maybe 1971 Firebird Espirit had a Q-jet & TH350 Trans..."
The Class Racer Info site does not list any Q-jet equipped engine being available in a '70 or '71 Espirit. I can not verify this info, but according to the Class Racer Info site, there was no Q-jet equipped Pontiac 350 for the years '70-'73. In '74 there were some, available in Lemans & Ventura models, including the GTO. Hey, it's just a little 350 Pontiac trivia for anyone interested. I personally don't ever remember seeing a factory installed Q-jet on any Pontiac 350. But, there were obviously some built in '68, '69, & '74 thru '77. Don't know what year the TH350 was first used behind a 400 4 barrel engine. Anybody know, for sure ? 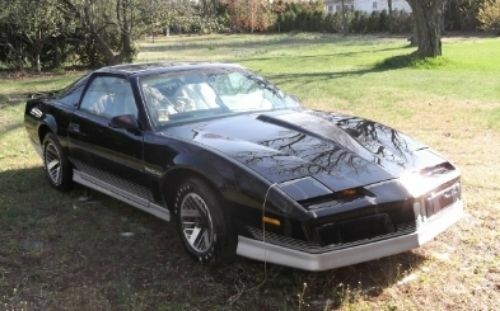 I bought a 1977 Formula Firebird with a Pontiac 350 4 bbl Q-jet and Turbo 350 Transmission. My Dad had a 1974 Pontiac Grand Prix with a Pontiac 350 Quadrajet and Turbo 350 Transmission. He bpught it new in 1974. It was around till 1990. I had 2 Formula Firebirds. 1978 That was Mayen Red with Hurst Hatch T-Tops. 4-speed with the 350 Chevy 4-bbl. Factory. Blk Deluxe interior. The 1977 Fomula .Silver 350P TH350. Mike had a 1969 Boss 302 Mustang 4-speed. I think it was 1975 model year. Trans Am got the Turbo 350 Auto instead of Turbo 400. Because of the huge catalytic converter . Turbo 400 would no longer fit. I recall John NOTATA saying his 1970 Firebird Espirit is a 350 Pontiac original . Remember he uses a TH350. I remember driving around in the 1974 Grand Prix with my Little Brother. We were just 4-6 years old. Jumping around on the backseat and enjoying the fast ride. "My Dad had a 1974 Pontiac Grand Prix with a Pontiac 350 Quadrajet and Turbo 350 Transmission. He bpught it new in 1974..."
Just looked up '74 GP specs. Everything I can find shows that the base engine was a 400, and a TH400 was the only trans available. Obviously, I can't verify, and we all know that not all online info is correct. I can say that every GP I ever saw had a TH400. CRI site shows that a 350 was available in a GP in '76 & '77, but not in '74 or '75. It was a Pontiac 350 And Turbo 350 Trans. My Dad blew out that Turbo 350 trans at leaat 3 times. He was a Maniac in that 1974 Grand Prix. Its too Bad a Pontiac 350 is forgotten. I think they were better than a Chevy 350. I remember my 1977 Formula Firebird was quicker actally than my Chevy 350 78 Formula. I had a 1976 Grand Prix when I was 28-32. I think 1976 was the last year a Turbo 400 waa used by Pontiac. Firebird Formula / TA and Grand Prix my favorite Pontiacs. Well, that got complicated in a hurry. A lot of what we are remembering is wrong (myself included) and I never thought about the whole issue of a general lack of 4-barrel 350's. Even if that combination were available (GM is a big company) they wouldn't be easy to find today anyway except maybe in the Chevrolet version. 2 barrel throttle arms wouldn't help in the years in question. Hmm. Oldskool, I was talking from memory about the 350HO. I may well be wrong. At this point I'd probably be breaking out the welder. I pulled a bracket off the throttle shaft of another junk carb. I grinded down the stake on it to remove it. The carb I want to use has a screw attaching it to the throttle shaft. So I took the existing arm off, the replaced it with the donor arm. Seems to work as it should. I have seen pictures of the throttle arm I had on it before using the arm for the spring as the attaching point for the kickdown cable and spring. I will post up some pics this afternoon, and see how it goes..
That sounds like the way to go. Here is what I ended up doing, with the exception of the return spring ( I am going to use one that fits better, just have to go through the stockpile). I used a universal bracket I bought locally. It seemed to do the trick. Looks like it should work. I've never seen a slashed vent on that late a model Q-jet. I assume the slash was added ? "...The carb I would like to install is 17056312..."
Wow, that number appears to be for a Chevy carb, since the next to the last number is a 1. But, the only front inlet Chevy Q-jets I've heard of came on some Chevy trucks, I think maybe with a 454 engine. Also, I assume that the #3 in your carb number should be a 2 or a 5, since the #3 denotes a 1-barrel carb. Last April I bought a big Lot of parts in Albuquerque. I bought them from a guy who was selling them on behalf of his brothers estate (his brother had passed away 1 1/2 years ago). There were a bunch of carburetors ( all quadrajets) and several that were rebuilt still in boxes. I chose this carb because it has an electric choke and that might make life simpler. Anyway, there were labels on each of the carbs to show what they were intended to be used for. Not that it mattered because even the ID numbers didn't really match up the what they were labeled to be used for (as in this case). So I am going to use it on this motor since the PO on this car had an edelbrock manifold and a QJ on it. Ill see how all works out as it goes. If it works as good as it looks you'll be all set! I like that secondary pullover deflector too. Not all QJs have them. Altho I've never had the problem, (that I knew of), the they's say at tip in, some fuel could be sucked over the top, causing a distribution problem.